Reviving. 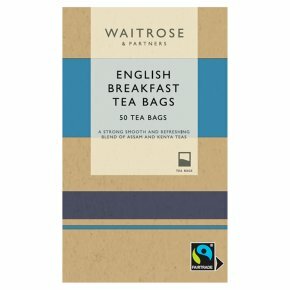 Small leaf tea, specially selected and blended for Waitrose. Rich flavoured assam teas have been combined with bright golden teas from the highlands of Kenya to give a blend that is both strong and refreshing. On the back of the pack. Use one teabag per person. Use only fresh drawn water, do not reboil. Pour water onto the teabag as soon as it boils. Stir immediately. Leave for 3 - 5 minutes, depending upon preffered strength. Add milk, if desired.